Holidays in London are exciting, busy and really freaking expensive. As much I kept telling myself that the museums and parks were free, we still managed to hemorrhage cash on an hourly basis. At the end of our holiday we came home a little fatter, a little poorer and a little overtired. It was a fantastic family experience, but definitely not a holiday that involved a lot of a rest. This week has been all about putting one foot in front of the other, children catching up on sleep and eating lots of vegetables. On Thursday night (because Thursday is our Friday) we had a family game of Monopoly and reminisced about Regent, Oxford and Piccadilly Street. They all have a different meaning now. Friday was spent by the pool. It was heaven. A day of pure nothing. Nowhere to go, nothing to do, we read newspapers, glanced at magazines and intermittently swam. It was exactly what everyone needed. G and I were meant to be going out to dinner, but by the time 4 o’clock came we realized dinner at home was sounding a lot more appealing. The little travelers were having one of those out of the blue we all love each other days, and we had 3 episodes of survivor waiting for us. G decided it was time for the third edition of Get Your Knickers Off. Or as my friend Paula referred to it the other day, the GYKO. Thank God Knickers doesn’t start with a N. Not quite as appetizing. We stopped at the shops on the way home and collected some prawns, some Saudi Feta (they make really good Feta in Saudi Arabia – I know, who knew?!) and some pomegranate seeds. And with a little help from Jamie Oliver, G came up with this. We didn’t have any avocados otherwise this would be Jamie’s Prawns and Avocado with an old-school Marie Rose sauce. 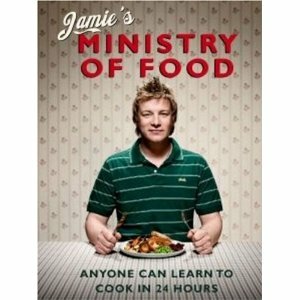 G bought Jamie’s “Ministry of Food” while we were in London and it’s full of really good, simple recipes. It would be a great cookbook for a teenager leaving home or for someone who feels they can’t cook. The prawns were really delicious. G dusted them in flour, and then cooked them in olive oil with some garlic, a bit of salt and pepper and paprika. That’s how they got that fabulous colour. The sauce was similar to the one my mother makes for the compulsory Christmas prawn cocktail, which is probably why Jamie calls it an “old school Marie Rose sauce”. 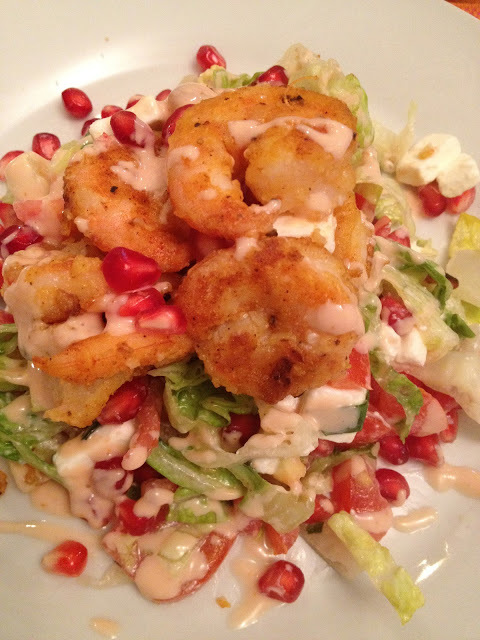 The salad was crispy lettuce, feta, pomegranate seeds and a couple of home grown tomatoes. The little travelers had strawberries and ice-cream for dessert, while I snuck in a few stray easter eggs with a really yummy glass of red wine. Half way through the second episode I looked around the room and noticed we’d had a few casualties. The 2nd little traveler began on the beanbag and ended dangerously close to the beagle’s bottom. The beagle is just not good at sharing. The third little traveler was on my lap.